My teaser this week is from a book that I just finished reading. 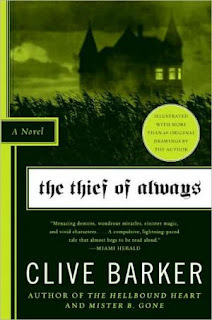 It's like a children's book, that is also for adults called The Thief of Always, written by Clive Barker. A little boy named Harvey is sitting at home, bored, with no idea what to do. The idea comes though, when a man named Rictus comes flying into his house through a window. He invites Harvey to spend some time at a wonderful place called Holiday House. Harvey gladly agrees. Soon though, Harvey realizes that Holiday House isn't as magical as it seems. "The great gray beast February had eaten Harvey Swick alive. Here he was, buried in the belly of that smothering month, wondering if he would ever find his way out through the cold coils that lay between here and Easter." Great cover, great title and wonderful teaser. I loved this book - what a great a choice! I've been in that February belly before. lol Sounds like a great story. Sounds crazy. Good teaser. Thanks for sharing. If you get a chance, mine is here. Looking at the cover, I wouldn't have thought children’s book, how interesting.. Being stuck in the belly of a monster, how terrible. Thanks for sharing, and thanks for stopping by my blog. LOL. After the long winter we just had, I can relate to February as a great gray beast! Thanks for a terrific teaser.